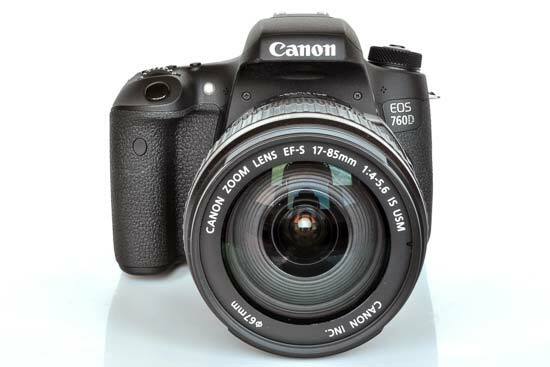 The Canon EOS 760D/Rebel T6s is the more feature-packed of two cameras that replaces 2013's EOS 700D/Rebel T5i. Its stable mate is the 750D, which shares the 760D's key components, but has fewer controls and slightly inferior live view autofocussing. The 760D and 750D share Canon's new 24.2MP APS-C sensor and DIGIC 6 processor, which enables a 5fps maximum shooting speed and a maximum expanded sensitivity range of ISO 100 – 25600. The new camera also inherits the 70D's 19-point AF module, with all points being the horizontally and vertically sensitive cross type. In addition to the 760D's extra physical controls, it also packs Wi-Fi connectivity with NFC pairing and sports a touch-sensitive, fully-articulating 1040k-dot monitor, plus a secondary LCD display on the top panel. All this can currently be had for around £649/$849 body-only, or £953/$1099 with an 18-135mm kit lens. If you've already read our Canon EOS 750D review, then you'll already have a pretty good idea of what the 760D is like to use, as the two cameras have a lot in common. With that in mind, we'll start this review with what distinguishes 760D from the 750D, before moving on to shared features. 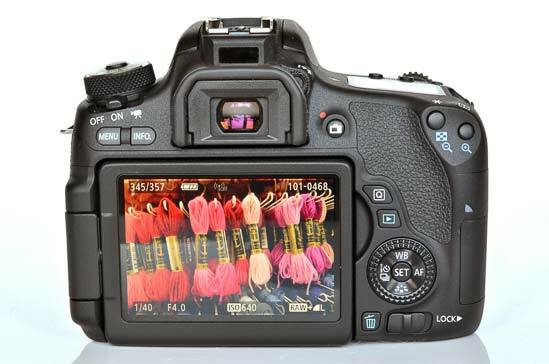 The majority of the 760D's differences are external, with the most obvious being the top panel LCD that's only traditionally been included at the 70D level and above. This can be useful as it provides a clear and consistent display of key shooting settings whilst using less battery power than the main rear LCD. If you've grown used to this type of display from the days of 35mm film SLR cameras, or you're familiar with mid to high-end DSLRs that include these screens, then the 760D's top panel LCD will be a welcome inclusion. On the other hand, if you're upgrading from a 700D or lower-spec camera, this secondary screen alone isn't worth the extra outlay over the 750D. With the additional LCD dominating the right hand side of the top panel, the mode dial has moved to the left and has also acquired a locking button where the 750D does without. This is another feature more commonly found on high-end DSLRs and prevents accidental mode dial adjustment, although the placement and stiffness of the 750D's mode dial means it's not particularly susceptible to unintentional movement. One thing we did find with the 760D's mode dial, albeit only on one occasion, was an instance where the shooting modes went two or three positions out of sync with the position of the dial itself. Hopefully this intermittent fault can be easily fixed with a future firmware update. 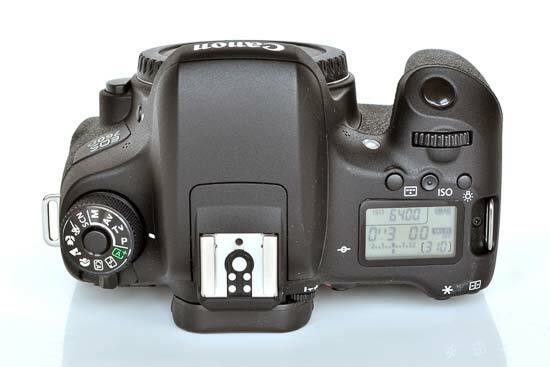 The third and so far the most useful benefit of the Canon EOS 760D is its rear panel control wheel that encircles the D-pad buttons. Like the top panel LCD, this is a feature you'd normally only get on a 70D-level camera or higher, and it adds a level of direct control that makes the 760D appreciably easier to use than the 750D. Instead of having to use alternate function buttons in conjunction with the top panel control wheel, the 760D's rear panel dial lets you adjust exposure compensation more ergonomically than with the 750D, and provides dedicated aperture adjustment (with the top wheel controlling shutter speed) when in Manual mode. It also enables fluid scrolling through images in playback, and cycles through menu items whilst the top wheel is used to switch menu tabs. Now there's no need for an exposure compensation button, the Quick Control menu button takes its place as the upper of the two buttons cited directly above the D-pad controls. The lower of this pairing is now the playback button, which falls more easily to hand in this position than it does in its much lower location on the 750D. This spot is now occupied by the delete button, and alongside this on the 760D is a locking switch that by default can disable the rear panel control wheel to prevent any accidental exposure compensation changes, although it's function can be customised in the main menu. 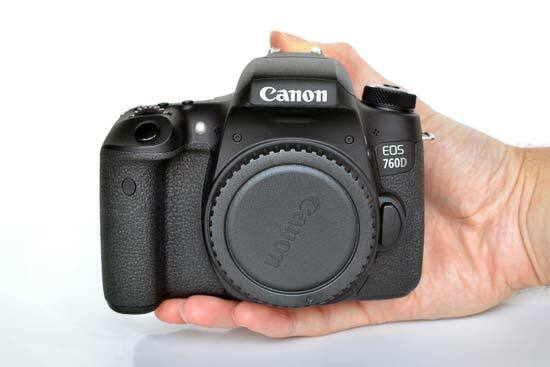 The Canon EOS 760D also sports a small eye sensor window located between the viewfinder and the hotshoe mount. This is an eye proximity sensor that automatically disables the LCD screen when you look through the viewfinder. The 750D can't pull this trick, although you can achieve the same result by simply pressing the display on/off button on the top panel. The final advantage that the 760D has over the 750D is AI Servo autofocussing in live view. This feature is available in both cameras when using the viewfinder, however in live view the 750D can track a subject but refocuses when you go to snap a shot, introducing a slight but annoying delay. Providing you half press the 760D's shutter release, it'll maintain focus before and during a shot with none of the 750D's focussing hesitation at the point of shooting, which is nice if you spend a lot of time photographing moving subjects through live view. 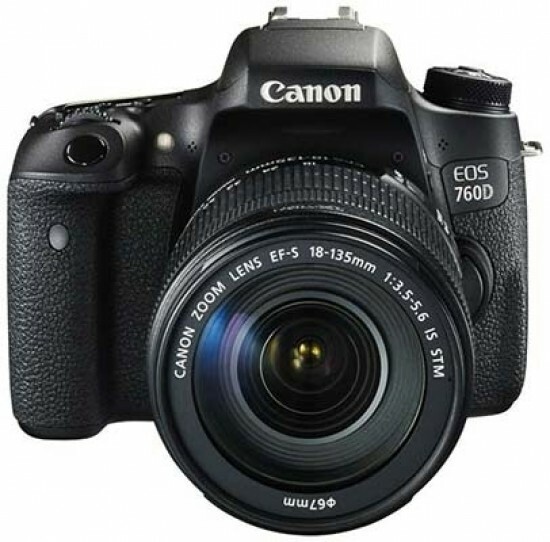 And that's everything that the Canon EOS 760D has to offer over the 750D – in every other respect they're identical, although the 760D is 0.2mm taller at 100.9mm, probably due to its viewfinder eye sensor. The two cameras share the same 131.9mm width and 77.8mm depth, making them slightly narrower and shallower than the 700D. Canon has also managed to bring the 760D 15g under the 700D's weight, even though you get more external gadgets. Although these toys bring the 760D more in line with Canon's more professionally-orientated DSLRs, you'll still need to step up to a 70D to get any degree of weather sealing. That's not to say the 760D feels cheap though. Its plastic body is tough and doesn't show any signs of flex, plus you get a generously-sized rubberised rear thumb grip. Next to this is a 3-inch, 1040k-dot LCD monitor which, like the 700D before it, features touch sensitivity. The capacitive panel is responsive and fast, but if you're more familiar with traditional DSLR controls, you don't have to use it. However, some of the menu options for selecting scene modes or creative effects can be a little tricky to navigate with the buttons alone, whereas the touch controls are much more intuitive. You'll also get to control focus points when in live view, which can also be faster than switching focus modes via buttons to get selectable point autofocussing. Swiping through photos in playback mode is also fairly slick, though the 760D's rear panel control wheel is just as effective. Like the 750D, the Canon EOS 760D's screen can fully articulate to make low and high angle shooting much easier, though you won't need to adjust it to get accurate colour and contrast, as both are consistent when the screen is viewed from even extreme angles. Compose shots through the viewfinder and you'll find it's got a 95% field of view, which is a match for the Nikon D5500, but not up to the Pentax K-S2's 100% frame coverage. This might not sound like a big deal, but if you're trying to make an accurate shot composition, there can be a surprisingly noticeable difference between the frame boundaries as viewed through the viewfinder and the edges of the captured shot. Moving to the top panel and the mode dial, though in a different position to the 750D, contains exactly the same options. There's the usual Program Auto, Shutter Priority (Tv), Aperture Priority (Av) and full Manual control, plus a scene-detecting, fully automatic mode. Despite the 760D being targeted more to enthusiast photographers than beginners, the mode dial is still packed with dedicated scene modes like Sports, Close-up, Landscape and Portrait settings. These automatically select shooting settings and colour presets to help you take effective and flattering shots of particular subjects, though with a little practice you can easily replicate the same effects manually. A much more useful scene mode is accessed via the Scene setting on the mode dial, and it's the HDR Backlight Control mode. This captures multiple exposures with varying exposure biases and combines them into a single shot with much greater dynamic range than a single exposure. Also contained within the Scene option on the mode dial are Kids, Food, Candlelight, Night Portrait and Handheld Night Scene modes. Further round the mode dial is a Creative Auto setting where you'll find some more subtle scene modes which enhance images by applying slight colour variations, like a Landscape option where the camera uses a colour preset biased towards green. You'll also find a Flash Off position on the mode dial. This mode functions almost identically to the fully automatic Scene Intelligent Auto mode, except the pop-up flash is disabled, which is great if you're in an area where flash photography is prohibited. On the opposite side of the top panel, in front of the secondary LCD display, there's a dedicated ISO button, which is a welcome inclusion given that Nikon won't give you one on the equivalent D5x00 series. To the right of this button is a useful control for turning the rear panel display off, and on the left you'll find an autofocus point selection button which gives you the ability to switch quickly from normal autofocussing to configurable zone or single point options. The autofocus system itself is an upgrade over the 700D's offering, with 19 points compared to 9, and whilst that still trails the Nikon D5500's 39 total points, all the 750D's AF points are the horizontally and vertically sensitive cross type, whereas the Nikon D5500 can only boast 9 such points. This all adds up to very capable AF performance that's both fast and accurate, or at least with our EF-S 17-85mm f/4-5.6 IS USM test lens fitted. In good light the Canon EOS 760D was able to focus in less than 0.1 seconds, slowing only to around 0.5 seconds in dimmer conditions. Like the 750D, the 760D gets Canon's latest DIGIC 6 image processor, though the greater megapixel count over the 700D cancels out any potential increase in continuous shooting speed, with all three cameras rated at 5fps. However, the 760D will shoot at this speed for up to 940 JPEGs, whereas the 700D's buffer is full after just 22. Another area where the 760D improves over its predecessor is wireless connectivity. The 760D boasts Wi-Fi with NFC pairing, meaning you can simply tap an NFC-enabled smart device against the camera to create a connection. The process is less elegant if you need to connect manually, but once hooked up, you'll be able to remotely view and transfer the 760D's images, with a Fine quality JPEG image transferring in roughly eight seconds. This is made possible with Canon's Camera Connect app, which also enables the 760D to be remotely controlled. The only area where the Canon EOS 760D's usability is somewhat disappointing is battery life, as the new camera can only manage the same 440 shots-per-charge as the 700D. That's less than half the number of images that the LP-E6 Li-ion power pack in the 70D can generate, but it's also way down on the Nikon D5500's 820-shot lifespan.